Standing in his Cyprus Avenue house, a fifty something Belfast unionist holds his baby granddaughter in his arms. As he looks down at the warm bundle of new life he sees Gerry Adams staring back. While the trademark beard and glasses are missing, the baby’s eyes trigger a volcanic eruption of identity angst, and ultimately brutality within the heart and mind of Eric. At first David Ireland’s play Cyprus Avenue could be mistaken for a satire. It’s a quare stretch of imagination even for an east Belfast uber-unionist to be so haunted by the, then, president of Sinn Féin. Glee and merriment ripple across the Belfast audience who lap up the blatant on-stage sectarian expression and understand the phrase ‘fenian eyes’ without having to wait for the explanation in the script that helped London audiences in the play’s 2016 West End run. Slowly it becomes apparent that Eric’s behaviour and utterances are not merely the wild imaginings of a playwright who wants to lampoon loyalism. Yet the resulting caricature of an extreme unionist standpoint is beyond the worst excesses of so-called ‘PUL culture’. Psychosis is at work and Eric’s poor mental health is being incensed by the political and religious zeal with which he surrounds himself. 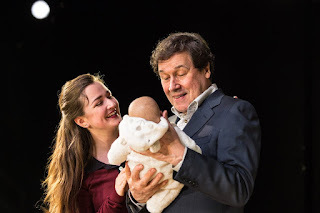 Stephen Rea adopts the detached persona of Eric, hunched over with the weight of unionism on his back, hand gestures kept close to his expressive face, giving unexpected answers to straightforward questions. Dressed in a suit and open neck white shirt throughout the one hour forty minutes he spends on stage, he doesn’t start out as a thug. Rea creates a monster who can dispassionately go to whatever lengths are necessary, and use whatever vocabulary most fits his rage, as the calm Cyrus Avenue household is turned upsidedown. Amy Molloy plays his daughter Julie, the single mother of the child at the heart of the frenzy. She explores the twin motivations to protect her daughter while wanting to console and understand her troubled father who is thrown out of the family home by his underwritten wife Bernie (Andrea Irvine). 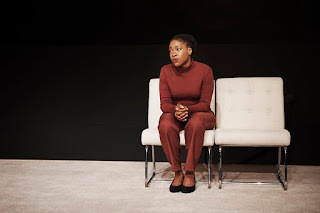 Molloy’s unexpected song – a little indistinct given her prone pose – added some warmth and pathos to a particularly dark run of scenes. When budding paramilitary Slim bursts into the script, the laughter peaks before the level of peril is punched up and it all goes a bit Tarantino. Anyone complaining about the crass depiction of loyalism in Cyrus Avenue needs to take another look at Chris Corrigan’s considered performance which echoes thinking loyalism’s grasp of Irishness amongst its more jingoistic British tendencies. The large square of cream carpet in Lizzie Clachan’s wall-less set is only interrupted by some cream chairs and a small table. Paul Keogan’s lighting rig hangs low over the stage, creating a very natural home-like reverb and leaving the audience who are seated on two opposite sides with the option of either staring at the actors or staring across the stage to assess the reaction of other audience members. Bridget is the only woman in Eric’s life who can stand up to him, who has the power to make him reflect on his words and his actions. When he directs an offensive term towards her, the unflappable phycologist played by Ronke Adekoluejo calls him out on it and he modifies his vocabulary (while demonstrating that he still doesn’t quite get why he needs to). Throughout the play she continues to quietly question his rational and probe for any signs of remorse or self-reflection. While Cyrus Avenue left a slightly sour taste in my mouth, it also left me with the question of where were the Bridgets in Northern Ireland society? Where are the people who can make themselves heard as they calmly question the harmful nonsense that informs so much public and private decision making? Martin McDonagh might have threaded a moral tale through such a dark tale. Abbie Spallen might have stuck to the satire. But David Ireland chose to cross fade from the hilarious to the harmful to leave audiences in a knot about their enjoyment of this horrific tale that spills a lot of blood on the cream carpet. As I read the reviews from London this time two years ago I assumed that no Belfast theatre would be ‘brave’ enough to bring the play to Northern Ireland. It would be too close to the bone. I jumped at the chance when a spare seat became available for the nearly sold out run in The MAC. Yet the boldness of David Ireland’s visceral writing and the confidence of Vicky Featherstone’s direction delivered fabulous performances and brilliant theatre but lacked the profundity I read into the earlier reviews. Identity, misogyny, false religion, extremist politics and bigoted delusion are thrown into the mix along with mental health, strong languages and violent scenes that will disturb in a play that at one level is a hate crime, at another makes comment on male violence against women during and after conflict, and at yet another is an analysis of unionist and loyalist identity that makes familiar points but stops well short of suggesting any answers. 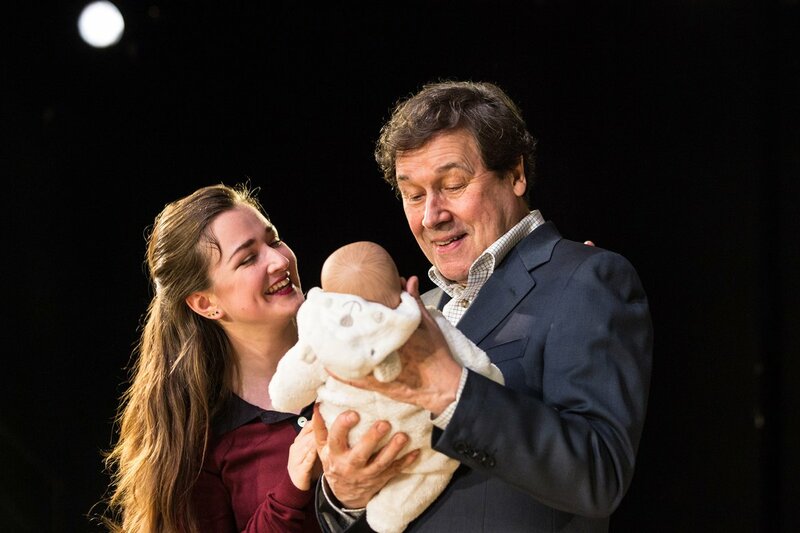 Cyrus Avenue continues at The MAC until 26 April with just a handful of seats left for the final performance before the show heads over to New York.